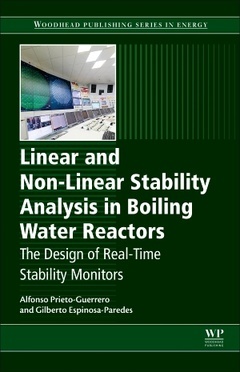 Linear and Non-Linear Stability Analysis in Boiling Water Reactors: Applications and Fundamentals of the Design of Real-Time Stability Monitors presents a thorough analysis of the most innovative BWR reactors and stability phenomena in one accessible resource. It firstly presents a summary of existing literature on BWRs to give early career engineers and researchers a solid background in the field, as well as the latest research on stability phenomena, nuclear power monitors and advanced computer systems used to for the prediction of stability. It emphasizes the importance of BWR technology and its embedded neutron monitoring systems (APRMs and LPRMs) and introduces non-linear stability parameters that can be used for the onset detection of instabilities in BWRs. The linear signal processing methods of autoregressive models, Fourier-based methods and other advanced methods, such as wavelets to calculate the decay ratio, are also analyzed to establish the scope of each method, and the advantages and disadvantages of each are considered throughout. This book will be a valuable resource for nuclear engineering students focusing on linear and non-linear analysis, as well as for those working and researching in a nuclear power capacity looking to implement stability methods and estimate decay ratios using non-linear techniques. The inclusion of analytical case studies of existing plants helps the reader to apply the theory learned to their own projects to identify well-established patterns of oscillations and implement stability methods within new and existing BWR nuclear power plants. Dr. Alfonso Prieto-Guerrero received his PhD in Sciences in Digital Signal Processing from the National Polytechnics Institute of Toulouse, France. He is currently working at the Metropolitan Autonomous University Campus Iztapalapa (UAM-I), Mexico and his research interests focus on the domain of signal processing and its applications. Dr. Prieto-Guerrero has worked on signal compression, speaker recognition,and communications applications, and is currently collaborating on projects related to nuclear reactor signals. In 2007, he spent time at the TESA laboratory (Telecommunications for space and aeronautics) in Toulouse, France, where he collaborated in the regional project OURSES on biomedical applications via satellite. In 2014, he was awarded the Best Paper Award at the Thermal-Hydraulics international conference (NUTHOS-10). Dr. Gilberto Espinosa-Paredes is Professor of Transport Phenomena, Nuclear Engineering and Reactor Physics, and Applied Mathematics at the Metropolitan Autonomous University Campus Iztapalapa (UAM-I), where he has been since 1997. Dr. Espinosa-Paredes recently served as Guest Editor of Science and Technology of Nuclear Installations on Severe Accident Analysis in Nuclear Power Plants, and has served on numerous editorial boards. Dr. Espinosa-Paredes is a member of the Mexican Engineering Academy, Science Mexican Academy, and Level III of the Mexican National System of Researchers (SNI). He has around 200 publications on nuclear energy and geoenergy; in 2014, he was awarded the Best Paper Award at the Thermal-Hydraulics international conference (NUTHOS-10). Dr. Espinosa-Paredes is well regarded as an expert in mathematical modeling applied to analysis and nuclear safety.